Happy Halloween! This past Wednesday was the spooky holiday, and I celebrated in style with a party put on by the OU Russian Club. Each attendee was given a pumpkin — a тыква — to decorate however we wanted while watching Russian cartoons and enjoying pizza. Rachick also supplied us with an abundance of candy to snack on too. 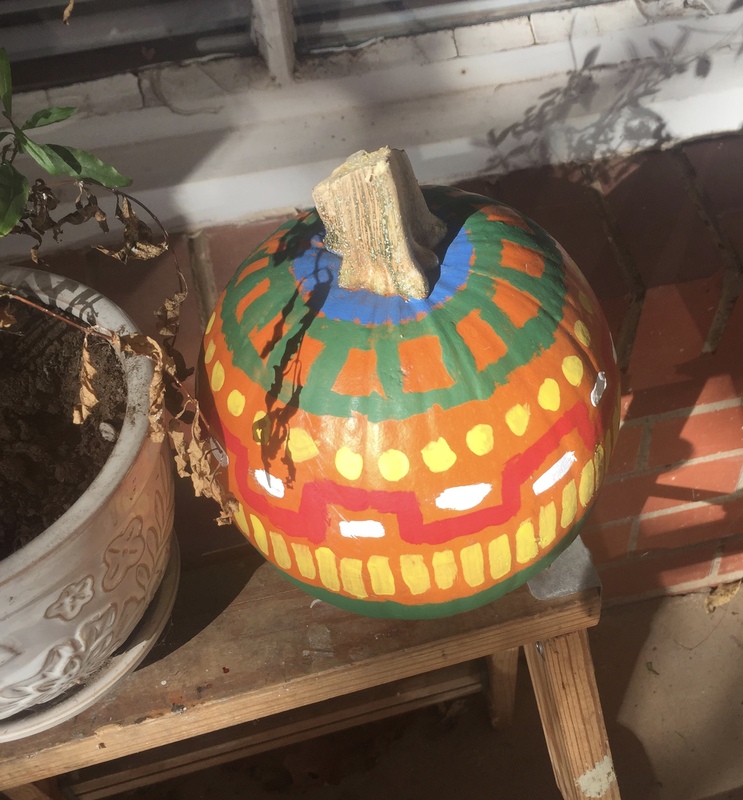 I opted to paint my pumpkin with a variety of colorful designs. I’m not a huge fan of Halloween doom and gloom and would much rather celebrate the festive nature of the end of the harvest season. 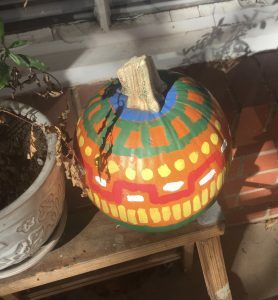 Callie painted a Russian Nesting Doll, a маленкая бабушка, on her pumpkin. There were a number of Russian flags, and one of the Russian club members painted Винни Пух on his pumpkin. Винни Пух is the Russian version of Winnie the Pooh. He’s definitely a bit different from the American version, but he still has the inherent goodness that endears Winnie the Pooh to all audiences. Earlier, Rachick had shown us Baba Yaga (Баба Яга) and Кощей Бессмертный, and while we talked about them a little bit during the Halloween party, we ended up returning to Винни Пух for the afternoon’s entertainment. has completed the tasks, Vasilisa only escapes when she mentions a blessing given her by her mother and Баба Яга throws her out. Stories like these show the ambiguous nature of Баба Яга in folklore. Кощей Бессмертный is less well known outside of Eastern Europe. Whereas Баба Яга can walk the line between good and evil, Кощей definitely falls on the more villainous side of things. ‘Кощей’ comes from the word ‘кость,’ which means ‘bone,’ and reflects his inhumanly thin stature. ‘Бессмертный’ means ‘the Deathless.’ He’s an immortal creature whose soul is hidden away so that he cannot die, and he is often the stereotypical male villain who kidnaps the hero’s wife. We watched a little bit of a cartoon featuring Кощей Бессмертный, but Баба Яга is a much more interesting character to me. When I spend time abroad in Eastern Europe (hopefully next fall), I’m excited to get more insight and hear more about Russian folklore. Here’s hoping that next Halloween, I’ll be spending it in a society where Баба Яга and Кощей Бессмертный are more common that Dracula and Michael Myers.